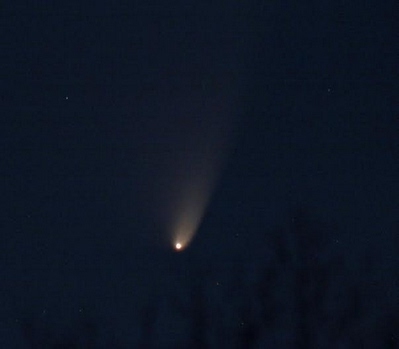 An excellent online guide to comets can be found here. Imaged by Damian Peach on 15 November 2013. He used a 4-inch f/5 refractor for 12 minutes of combined exposures. The field is 2.5° wide. Comet ISON was discovered on 21 September 2012 by Vitali Nevski and Artyom Novichonok, of the International Scientific Optical Network (ISON). It originated from the Oort Cloud; a place at the edge of the Solar System where comets reside beyond the orbits of Neptune and the Kuiper Belt. This comet was observed at 06:30am on 15 November 2013, the same day it was imaged by Damian Peach above. It was located 23 degrees above the East South-Eastern horizon, above and to the right of the star Spica in Virgo. Viewing location: Kusuma Promenade by the Lighthouse. 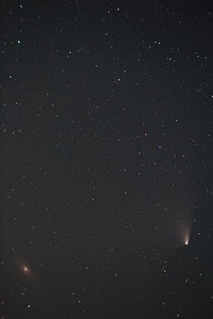 Comet PanStarrs was discovered in June 2011 by the automated Pan-STARRS sky survey in Hawaii. Its orbit brought it by the Sun for the first time from the outer reaches of the Solar System. After it spent billions of years in the cold of deep space, it will fly out again never to return. This comet was followed from 10 March to 25 March 2013.